I have a rule about not spending money traveling to friendlies during World Cup Qualifying. You have to prioritize somewhere along the line, and I would much rather go to qualifiers, than burn the budget on fun but meaningless games. But when US Soccer announced that the Centennial Match would be US vs Germany at RFK Stadium in Washington DC, I knew I had to go. I had promised myself that whenever the US next played Germany after Jürgen Klinsmann was hired, I would go, even if the match was played in Germany, and I justified that this expense in the middle of qualifying was probably not as bad as flying to Germany for this game, so I called my DC friends and started searching for a place to stay. That the Centennial coincided with my 20th anniversary as a US Soccer supporter was too good to be true. My first cap ever was USMNT vs Germany in the US Cup, on June 13, 1993, which I attended as a fan of German soccer, a habit I’d picked up living in Germany for Summer 1989. The ‘93 game was a pivotal moment in my career as an American soccer fan. My hero, Klinsmann scored in the 14th minute, the German machine performing as planned. But then, here was Tom Dooley, putting one in about 10 minutes later for the Americans. The AMERICANS? “They” scored on Germany? Impossible. Soon enough, my Germans had run it up to 4-1, and we were back on plan. But then there were those Americans again…Ernie Stewart scoring in the 72nd minute, and Dooley getting the brace several minutes later. What the hell was going on? I hadn’t even realized that Americans knew how to play legitimate soccer, let alone hold Germany to “just” a 4-3 loss. I was blown away. I walked out, took my Germany hat off, bought a shirt commemorating the game, and that day, became a supporter for US Soccer. Flash forward 20 years, and I made it to DC. My one goal for coming to DC was to finally meet Klinsmann. My Facebook wall has been littered with friends who met him at the airport, or at practices I didn’t get to town soon enough to attend, or the Centennial Celebration in New York City, and frankly, I was more than a little jealous. After all, I’d been a fan for DECADES, and here were people who had lukewarm trust in Klinsy with photos with him plastered all over Facebook, just mocking me. I was one more Facebook photo away from a full on toddler-force tantrum….something had to be done. First stop was the Nike Store event in Georgetown, a mob scene of kids who were too big to shove out of the way unnoticed. I tried not to think about the multiplier of the average age to my age, and I got positioned near the front…on the side that ended up the far side of Klinsmann and Tim Howard (my son’s current obsession) and near side to Clint Dempsey and Michael Bradley. I know, you’re thinking “there’s really not a losing position there.” And you’re right. Every single person on stage was amazing (thanks Nike/US Soccer), but given my goals as a mama and fan girl, I should have been on the opposite side. Taylor Twellman emceed a Q&A, that I half heard over the blood rushing past my eardrums, and then the autograph frenzy began. Nothing organized, with guys signing civilized behind a table, but a mosh pit of youth soccer players and I jockeying for position. I ended up getting Bradley’s and Howard’s autograph for both my kids (go Mom!) but I’m pretty sure Klinsmann vaporized soon after the autographs started. I asked one of my US Soccer contacts if Klinsmann was still in the building, and after checking, he said no, but if I found him at the Public Practice, he would try to help me get my Klinsmann photo. Are you kidding me? How many games has he played for the US (it’s 96, I looked it up) and how many has he announced, let alone watched, and he had the details from a particular game from 20 years ago? The man knows his soccer, and he signed the US side of my shirt. Take that, Lalas haters. The day continued to get more and more awesome. Between practices, we were hanging out at the Supporters Club sign in, which was next to the press area. While we waited for gates to open, we were greeted by former Nats goalkeeper Kasey Keller, and ESPN broadcaster Ian Darke. Keller was quiet, but stopped for photos and autographs, and Mr. Darke stayed and chatted with us for a while, talking about just hanging out like a regular guy chatting up soccer. He’s very thoughtful and insightful, and a pleasure to talk soccer with, so I was almost sad when they said it was time to head into the stadium. By the time I regained my senses, Klinsmann was right in from of me, startling me back to reality. I called out in German, asking “Can I have your…” Dammit. What’s the word for autograph? I came up with “writing” but he was already walking over, thank goodness, able to translate through the IQ lowering effects of fangirl overload. 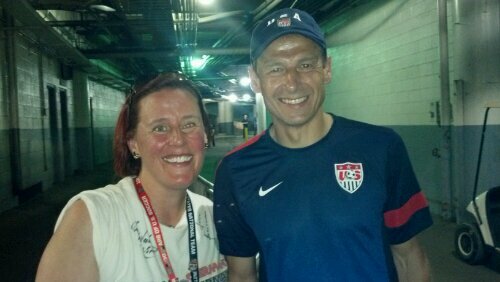 I told him how I’d been a German soccer fan, and came to see him play 20 years ago, how I remembered the goal, and that when the US came back to almost equalize, I became a US Soccer fan, culminating with “I’m a US Soccer fan because of you, and I just wanted to say thanks, and can I get a photo with you?” And that’s how I ended up with my coveted Klinsmann photo, complete with him smiling almost as wide as I am. My sincerest thanks to my friends at US Soccer who made this photo possible. Following this team has been some of my greatest adventures of the last 20 years. Mexico and Kids and Klinsman, oh my! I’m way behind on this blog. Sorry. I have lots to say about the Women’s World Cup and so much more, but I’ve been busy closing my store and traveling with my kids, this summer kinda got away from me. So let me say this: KLLLLIIINNNSMMMAAAANNN! Oh how I’ve waited for this day. I love German soccer, and started my love of US Soccer through a series of US vs Germany games. I wanted to have Jürgen Klinsman as our coach for years. I was hoping he’d be picked in the last hiring round, and I’ve definitely wanted us to hire him since 2010. And there is a bit of me pinching myself, not believing my dream has finally come true. As luck would have it, I get to go to his coaching debut with my kids, thanks to winning the Golazo Scavenger Hunt at the American Outlaws Rally! My daughter is now 8-3/4, old enough to be pissed when I don’t take her to games. My son is 4, funny and charming enough that I want to bring him just to see what he’ll do. So here we go! I feel like it’s the night before my 1st date with the dreamy senior I’ve been wanting to date since freshman year, and I’m super nervous that he’ll show up and not be the catch I thought he was. I really think Klinsy’s dateable material….and somehow, I will find a way to get some sleep tonight. But for now, it’s just Mexico and kids and Klinsman….oh my!